Dyspepsia. 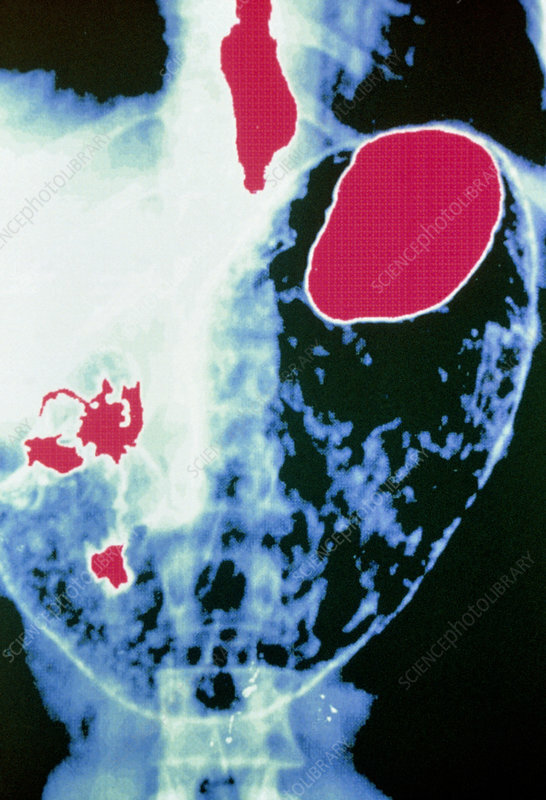 Coloured X-ray of the human stomach showing gastro-oesophageal reflux (heartburn) highlighted with a barium meal. The sac-shaped stomach (blue, at centre) is seen with the spine visible in the background. The acidic juices of the stomach (red) are seen passing abnormally back up the oesophagus (at upper centre). This causes heartburn: inflammation and a sense of pain that can rise to the throat. Heartburn is a type of indigestion. Barium, a substance opaque to X-rays, was swallowed prior to taking this image to highlight the structure, and any inflammation, in the digestive tract.